STRATHMORE – The Spartans 9-3 loss to the second place Corcoran Panthers may suggest a blowout when in reality, it was Strathmore who was a strike away from the biggest win this season. Strathmore (6-5-1, 3-3) had a 3-2 lead heading into the top of the seventh inning. With two outs and a runner on, Corcoran’s (9-5, 6-1) final batter struggled to make contact with the ball. Strathmore’s head coach Thad Reece wanted to improve their chances of getting the out, so he moved his left fielder up close to the in field. The move allowed Corcoran to tie up the game as the batter got a pitch over the middle, slapping the ball in between left and the short stop for an RBI single. The 3-3 tie wasn’t broken until the top of the ninth inning when Corcoran broke it open for six runs to capture their win. “We have to be mentally tougher if we are to get over the hump and compete in these close games,” Reece said. 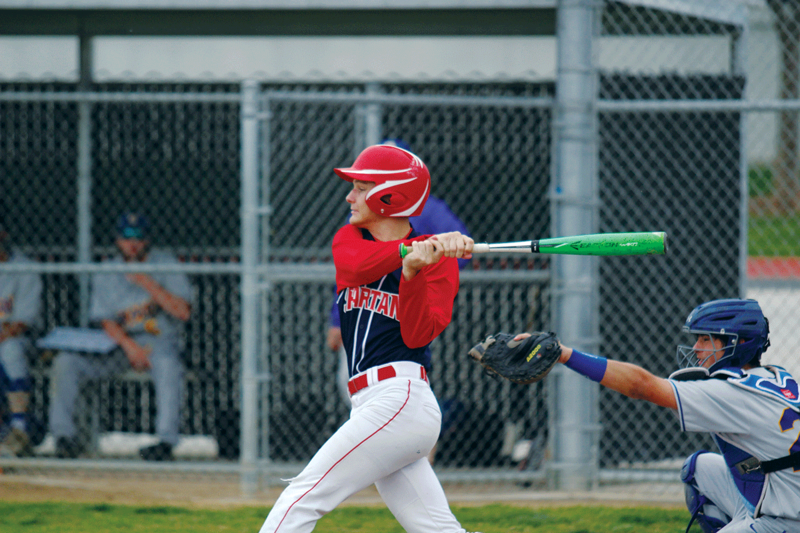 Strathmore was mentally tough enough to erase a two-run deficit in the sixth inning. A walk and a hit got runners on for Angel Topete. On a full count, Topete cut the deficit in half on an RBI double to the outfield. Rigo Alvarez followed with a two RBI single which gave Strathmore the lead 3-2. The Spartans could have broken the game wide open as they had no outs. However, the bottom of their lineup went down in three straight batters, stranding Alvarez 90 feet from home. “Every run is important in these close games,” Reece said. The bottom of the lineup has been where Strathmore has struggled the most at the plate, but on this night their top two hitters were cold as well. Lead-off man, Josue Topete, went 0-5, and William Reece in the number two spot went 0-4. “When we don’t get those guys on it really hurts us,” Reece said. Strathmore responded in a big way defeating the Laton Mustangs (0-11-1, 0-2) 15-0 on Saturday. Strathmore’s two lead-off hitters, Josue and William, combined to go 5-8 at the plate, scoring five of the Spartans runs and driving in another four. Due to rain outs, Strathmore has a full schedule on the horizon with many weeks holding three games. Tomorrow night, Strathmore plays at Granite Hills beginning at 4 p.m. Then on Saturday, the Spartans begin the Woodlake Tournament against the Dos Palos Broncos at 3 p.m.